This week we follow up on the notable serverless announcements from AWS re:Invent. Last week was of course AWS re:Invent so let's catch up with the latest in serverless announcements. Our links this week are all devoted to the announcements we found most compelling. Catch Us At the Stackery Booth? 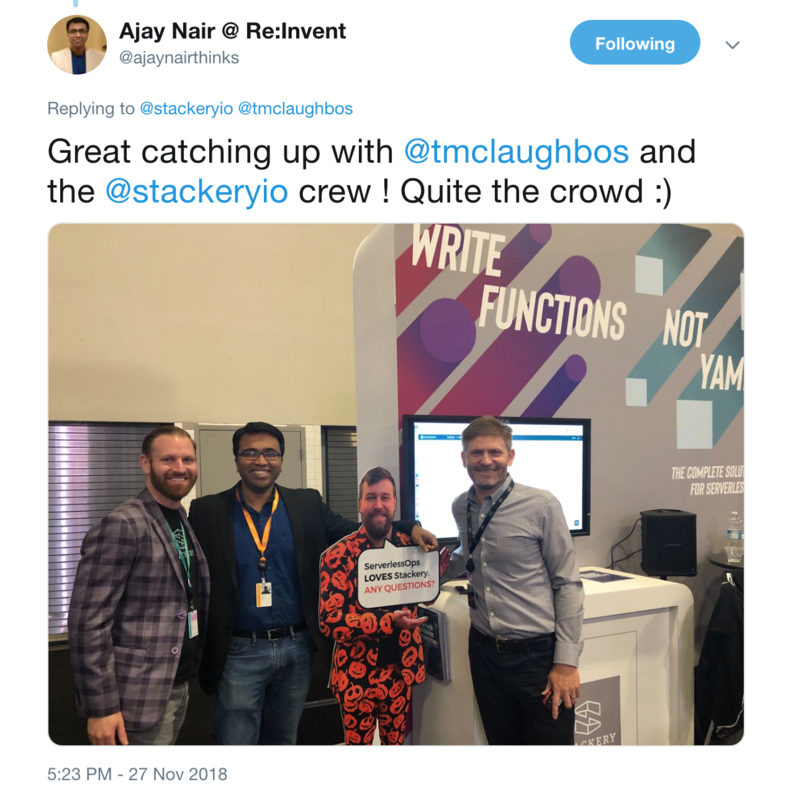 For those of you who attended the re:Invent, did you catch the Stackery booth? We teamed up with Stackery to distribute the Serverless DevOps ebook to attendees. I was even able to make an appearance as the shortest thought leader in serverless. One of my reasons for liking Stackery is I think the product is a great approach for those organizations just starting their cloud or DevOps journey. Configuration management via DSLs or YAML is still intimidating to many operations engineers! Stackery's visual approach makes getting started with serverless accessible to many operations engineers who would otherwise struggle. Their product fills a major gap in need. AWS uses four characteristics to identify something that is serverless. The "never pay for idle" characteristic always feels off with storage and database offerings. Even Paul Johnston's own explainer of serverless calls this out. That's why this new billing model is subtlety so interesting. DynamoDB finally conforms to the four AWS characteristics of what makes something serverless. While you're here, don't forget that DynamoDB also released support for transactions! Serverless Application Repository (SAR) and AWS SAM now support nested applications. I am extremely excited by this development because it takes us one step closer to nanoservices! I do see serverless possibly bringing us to a real low-code future through serverless reuse. Want Ruby support for AWS Lambda? What about PHP? AWS released support for custom runtimes via a new featured called Lambda Layers. Layers allow you to provide your own custom runtime to meet needs not currently satisfied by AWS. Layers support is available in the popular serverless management tools already. But the new layers functionality doesn't end there. It also provides a new way for companies to connect your Lambda functions to their product more easily. These are some of the companies already using layers to integrate with their platform. AWS has released extensions for popular IDEs to make working with serverless applications easier. This actually got me to break out VS Code for a short bit this weekend. However, still not ready to move away from Vim. I wonder what a Vim plugin could look like? CloudWatch Logs is great for very simple debugging.... But for any reasonable volume of load when needing to find something specific you were probably better off sending data to a Splunk, Elasticsearch, or maybe a DIY S3 + Athena setup. CloudWatch Insights lets you perform more complex queries than you could before in the AWS Console. AWS Firecracker made a lot of news during re:Invent. It's the virtualization technology that underpins Lambda and AWS released Firecracker as open source! Why is this announcement last? Because if you're reading this newsletter you're probably not building your own serverless platform which this is intended for. If you're curious further about the Lambda architecture, then checkout this re:Invent talk.